Today I’m passing over the posting to my mom FOD, who would like to talk about what it’s really like to care for a cat without a limb. Without further ado, I give you: mom FOD. Caring for a cat that has special needs requires a bit of extra preparation, but with a little forethought and knowledge of your kitty, it can be done easily. I can only speak on the topic of what it’s like to care for this particular type of disability, of course, but I wanted to share my knowledge in case any of our readers was considering adopting a three-legged cat but wasn’t sure about the type of commitment to expect. When Crepes first arrived, she was around 4-months old and very tiny at only 4 lbs. When she tried to walk, she did so with obvious difficulty and was comfortable mostly on the carpets and beds. She played with her siblings, but wasn’t as agile or as fast. The most common issue we had during this time was her inability to judge exactly how to maneuver herself around the stump. In Crepes’ case, she has a leg, but is missing a foot, so at the very end, she has only a thin layer of skin over her bone. When she moved too fast or jumped around, she would often bang the end of her leg on the floor, causing her obvious pain. Three out of four times, she’d bump it so hard that it would bleed. The solution that we’ve found to that is something called Vetericyn, (we are not sponsored by Vetericyn, this is based strictly on personal opinion) recommended to us by our local pet store. It’s an antiseptic spray that easily allows us to disinfect the wound without touching it, which is a great help since Crepes is very sensitive to having her stump touched. As time went on, Crepes learned how to maneuver herself all over the house and now, at a year and a half old, she rarely injures herself. Crepes cannot jump as high as the other cats; she’s able to jump onto the couch or coffee table and no higher. She can, however, climb like a champion using her front legs only. Her balance isn’t ideal, either, and a few times she’s almost fallen into an open toilet, so we make sure to close the lids when no one is around. And, because of her love of climbing but lack of balance, we have to make sure that we assist her down from places or discourage her from climbing to heights that might be dangerous. Other than that, Crepes runs around the house so fast that her missing leg is blurred by her speed and most people don’t even realize she’s handicapped until they see her walking slowly, which she does with a slight limp. 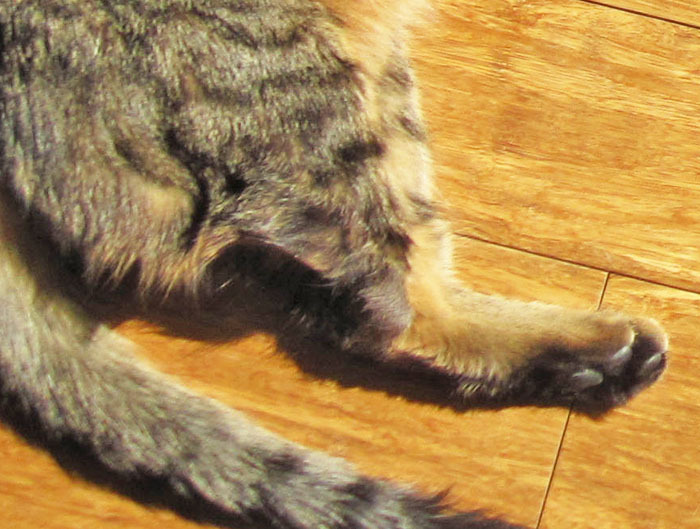 Caring for a three-legged cat has been not only rewarding, but extremely enlightening. Seeing my cat adapt to her physical handicap has allowed me to experience first-hand the resiliency of animals. Many times, I have seen Crepes overcome her problem with only a slight discomfort and, in the end, she believes herself to be no different than the other cats in the house. Given a bit of time and patience, and a little extra care, a three-legged pet can end up being your very best friend, teacher, and inspiration. PS everyone, I’m redoing my site to move to my own server REALLY soon! So if you notice any glitches, please be patient and let me know about them! I hope to make the transition as smooth as possible. Thank you! – Crepes. I once knew a cat whose one hind leg was broken in a fight (with dogs)…used to really like her…she led a normal life and was amazing to see her care for her kittens. Ah! I can’t have kittens! But if I could, i’d be darn good at it! – Crepes. Crepes, please thank your FOD for a very interesting article. Just one question, how did you lose your foot? I actually don’t remember. I also had a sister who was born missing a foot. Sadly, she didn’t make it as far as me in life. :/ So it might have been a birth defect. I’ve read that in the womb, kittens can get the umbilical cord wrapped around and limb, leaving it unable to develop. I’ve also heard that inexperienced mom kittens can occasionally nip off the tiny limb during grooming. Good thing my mom FOD doesn’t do that… – Crepes. jump…de pick sure shuld bee on page one…. Thanks! We’ve heard about these catramps before. I can still make it all the way to the top of my perch using just my strength, but maybe when I get older in 15 years or so. These would be great for two legged kitties, too! – Crepes. Thanks for sharing! Moving story about Crepes and it is always amazing how kitties adapt to such situations. Crepes you are a very inspirational kitty. Loved your story. Hi Crepes. One of our Angels, Peep, was a handi-kitty. Her leg was crushed. The Pound wanted to remove the leg but our Dad wanted a second opinion from his own vet. He decided to let it alone as she was not in pain. He said you can always remove a problem later but it is very hard to grow a leg back. She did not use the leg for maybe a year or two but slowly it fused and she would walk on it when she was going slow. Just like you most never even knew she had any problem at all. Purrs and we are glad we stopped by. Fantastic story. If more people had more patience, there would be more stories like yours. -Crepes. I just love Crepes! Thanks for doing so much to promote adopting a disabled cat. It’s so sad how they are overlooked and forgotten about. They have so much love to give. Gosh, thanks! I DO have love to give!!! – Crepes. Great post and terrific information. Real life information can really take the fear out of adopting a special needs animal. Crepes! Your story is inspiring! Thank you! Hi Crepes! Tabby’s Place has a very special kitty with only 3 legs too! I bet it doesn’t stop you from doing anything at all does It? It sure doesn’t stop Sabrina! 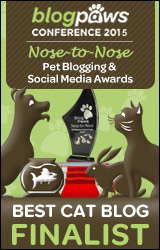 My momma just “tweeted” your blog link to all the Tabby’s Place twitter followers! I hope a lot of people read your story and follow your blog. I love reading it!! Oh, thank you for sharing! And no, it doesn’t stop me. I even scratch my head with my stump. I mean, it doesn’t feel QUITE as good as with my other foot, but still good. I also like to poke my mom FOD in the belly button with it. Can’t do THAT with a whole foot. – Crepes. I just adopted a little guy without a back foot just like Crepes but its a tiny bit longer to where he has a flat spot. I was just wondering if you ever tried a sock for the random scrapes on the ground? Or of you think that’s a good idea or not. I know he is supposed to callus but he’s getting sore and he’s only like seven weeks old. I taped a glove finger around it with a piece of cotton inside lol I couldn’t think of anything else. But now he uses it as a peg leg instead of not using and chews at the sock so I don’t know if the sock bothers him or if its cause he uses it when the sock is on. Experience would be great to hear from. Oh and I take it off at night so he can clean it, he’s very active and I have hardwood floors. My cat broke all four bones in her foot and her leg had to be amputated. It has been a devastating journey. I am a new pet parnt to a disabled cat and I am scared. I have a 3 legged kitten. She was born with 1/2 a back leg. She gets around fine, esp. when going fast! She does limp when walking. She is able to climb, jump, etc., has no fear. Thats a kitten for you! She is getting some hair loss on her short leg. Has anyone been successful putting a sock on for protection? We have mostley hard wood floors. Crepes sounda adorable! I have always been a big dog person. However through circumstances too long to explain I adopted a 3 legged cat. Since this is my first cat I don’t know any different. He is a great cat and he and my beloved dog get along great. I don’t even think of my boy Doc as disabled. Don’t even notice it until guests comment. I find it is an insight into how humans see each other rather then the “disability”. I will seek out disabled pets from now on as I see them as a complete blessing. What do you do to prevent ulcers on her stump? How did you treat it if she has had one? I have a cat whom in February was hit by a car (assumption). He’s now a amputee of right hind leg and tail. He’s experiencing horrible behaviors, body slamming doors, chewing / scratching on furniture (despite scratching post). Meowing at the door, chewing blinds, sleeping all day, up prowling at night. I live in a small studio, can this be because I will not let him outside and he’s depressed/frustrated? Thank you for your article Crepes! I am adopting a cat named Bobbie today that is missing one of her hind legs. We fell in love with each other in seconds, and she is to be my companion kitty for my anxiety and depression. I know watching her overcome her disability will inspire me to overcome mine.